Taking care of the look & health of my skin is very important to me. Have several steps in my skin care routine. Of course the first step is to cleanse your face. Make sure to pick a cleanser that is suited for skin type. The second step is to use a facial toner. Third step is to use a moisturizer. To be honest for a while I had omitted the second step in my skin care routine. Main reason being many toners had seemed to harsh. 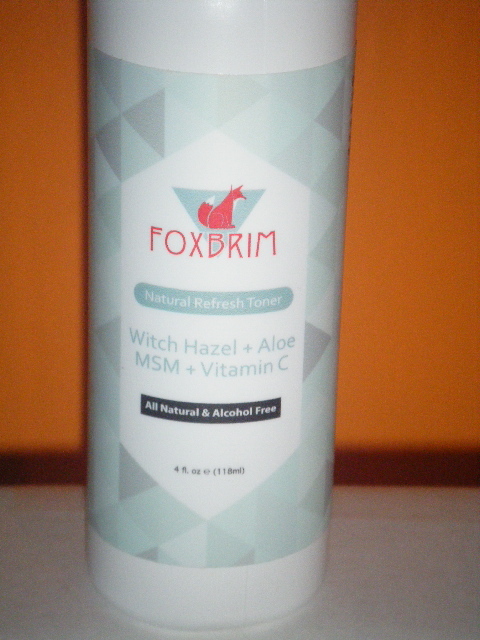 For about two weeks now I have been using Foxbrim’s Natural Refresh Toner. Many of you may want to know just what does a toner do for the skin? Of course toners are to be used after cleansing the skin. Toner’s help to restore your skin’s ph balance after cleansing. 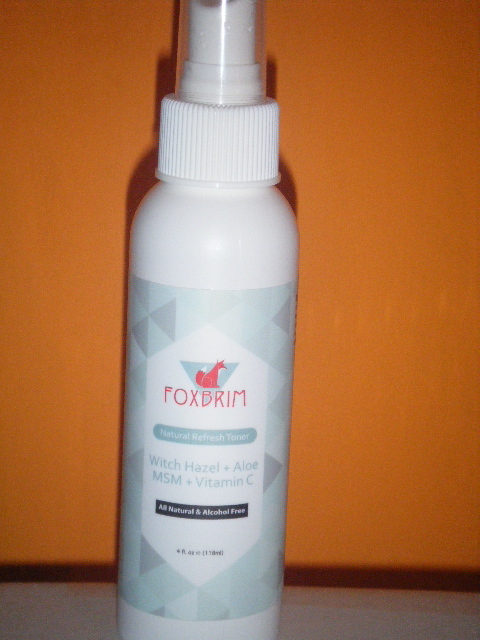 Foxbrim’s Natural Refresh Toner has Witch Hazel, Aloe, MSM & Vitamin C in it. Those are just a few of it’s key ingredients. What not in this toner? Alcohol is not in Foxbrim’s Natural Refresh Toner. Avoid products with alcohol as it can be drying to the skin. I use this toner twice a day every day. Even use this toner why my skin feels dry or need to be refreshed. Shake up your tonner before applying to your face. Lightly spray the toner to your face & neck area. Gentley pat the toner into your skin & allow to dry. Like that the witch hazel scent is very faint. This toner helps to refine my pores & balance out my skin. Like that the witch hazel scent is very faint. This toner helps to refine my pores & balance out my skin. Please check the links below. Thanks for taking the time to read this blog & have a blessed week. Have been trying out two new serums for almost a month now. 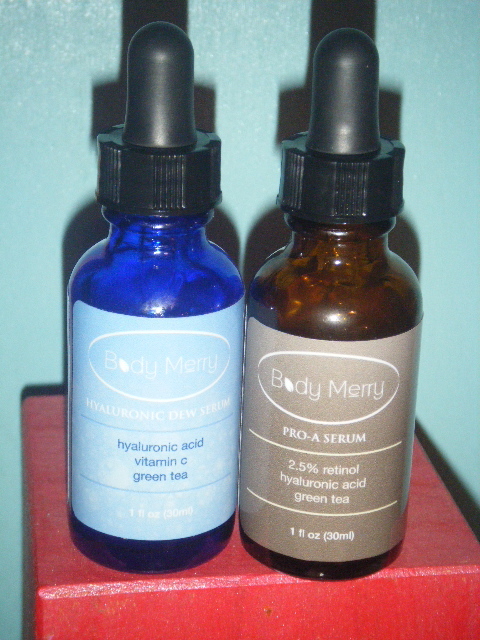 The serums are from a company named Body Merry. The two serums are their Hyaluronic Dew Serum & 2.5% Retinol Serums. Like to think of these serums as my morning & night serums. 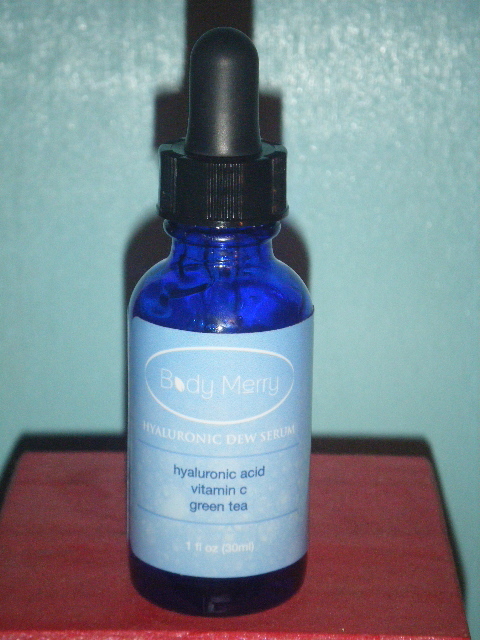 Let me first start with Body Merry’s Hyaluronic Dew Serum. The serum comes in a 1 fl. oz. cobalt blue bottle. Please have a look at the photo below. I use this serum in the morning. A hyaluronic serum is good for everyone. Hyaluronic acid serum has so many positive benefits for your skin. This serum is good for anyone of any age. The hyaluronic acid is from plant sources. Have any vegans in your life? This will make a great gift. 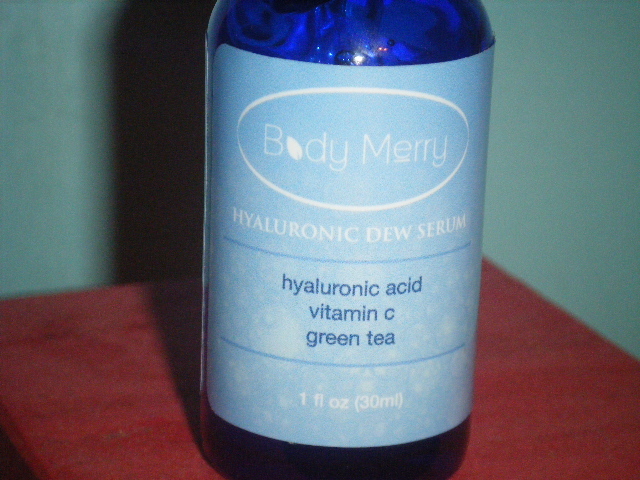 This serum also has vitamin c & green tea in it. So what are the benefits of this serum? I do like this serum. The serum is a bit to thick for my liking. Had trouble getting the serum into the dripper top as it was so thick. The serum is clear in appearance & absorbs quickly. Love that this serum gives me a fresh look to start my day with. 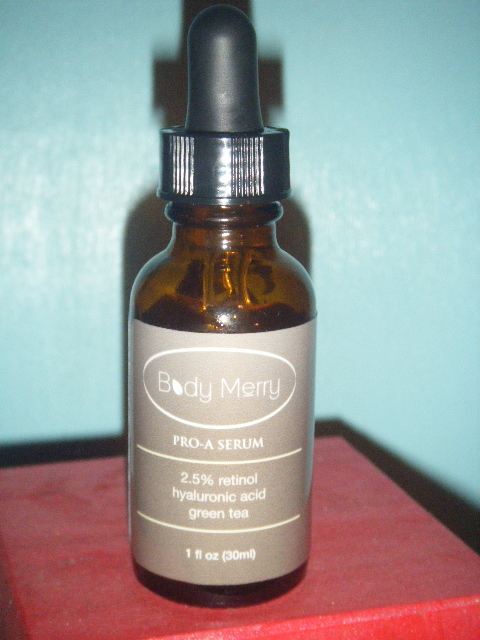 Next up is Body Merry Retinol Serum. The actual name is Pro-A Serum with 2.5% retinol. This would be my night time serum. Normally I try to use retinol products at night. Take a look at my photo of the serum below. As I said earlier this is my night time serum. It comes in a 1 fl. oz. amber colored bottle. Retinol has many benefits for the skin. Typical it’s used to fight against the signs of aging. Let me share with you some more of it’s benefits. This serum is also very thick, but now as thick as the dew serum. This serum is easier to get into the dripper top. It also absorbs quicker & does not leave a sticky feeling on your skin. While both serums come in 1 fl. oz. bottles each should last you for about a month. Was also able to try Body Merry’s Age Defense Eye Cream. Many people think eye creams are for aging issues, but that is not always the case. Body Merry Age Defense Eye Cream is also good for dark circles, dryness, bags etc. Please look at the photo of the product below. Few of Body Merry Age Defense Eye Cream are matrixyl 3000, vitamin c, peptide complexes. Yes those are great skin care ingredients. This is what I have experienced whilst using the product. This eye cream has helped with crepey dry skin on sides of my eyes, dark circles. It is not greasy or oily, and absorbs quickly. Love that it does not sting or burn. Has light scent that can compare to a spa like scent. Love this eye cream. The beauty market has lots of tools to help a person look their best. 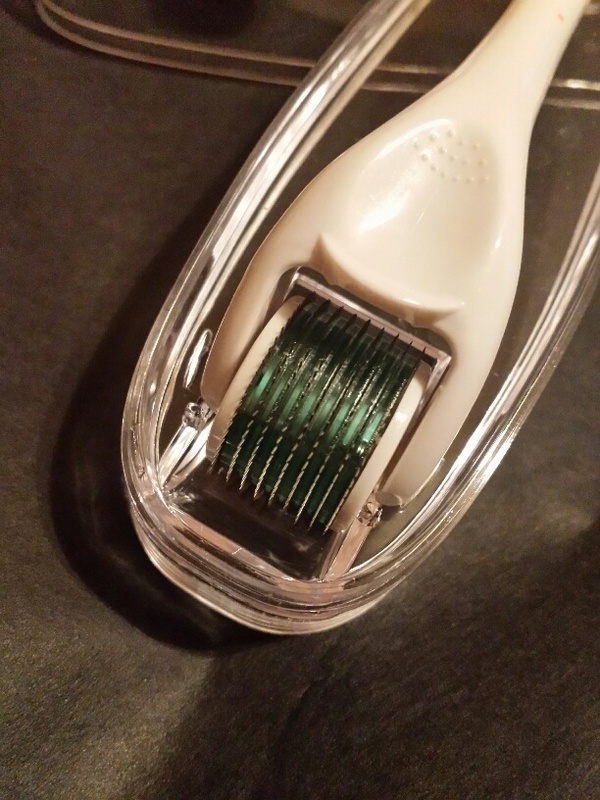 The topic of this post is about a derma roller. 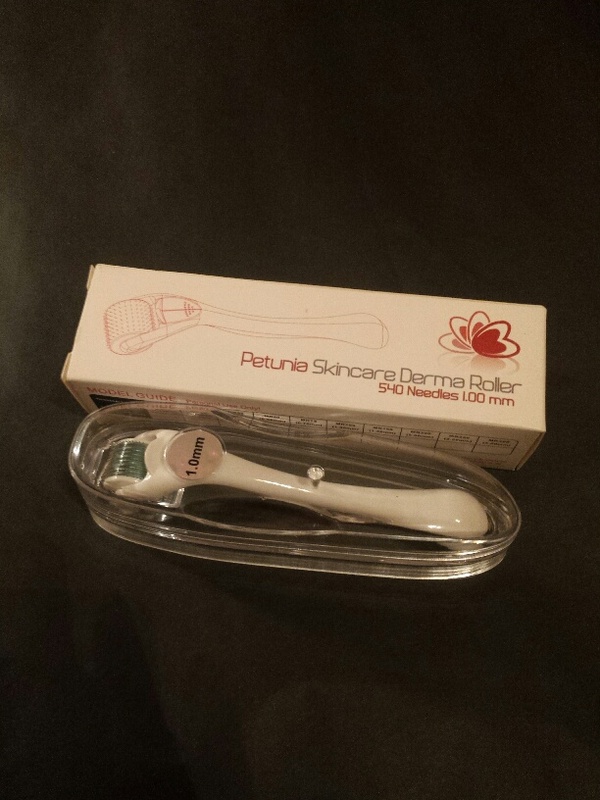 Petunia Skincare recently sent me one of their derma rollers to try. I have been using this derma roller for more than a month now. So what is a derma roller? A derma roller is device with lots of surgical-grade needles. The needle lengths vary from 0.13 up to 3 mm. Why would a person want to use a derma roller? Basically those micro needles in a derma roller force the skin to jump start it’s healing process. What are the benefits of using Petunia Skincare Derma roller? * Helps to firm & thicken the skin. * Can minimize the appearance of fine lines & wrinkles. * Stimulates collagen & elastin production. * Known to stimulate hair growth. * Helps serums, moisturizers to better absorb. * Reduce minor acne scars & stretch marks. All of the above sounds pretty amazing to me. Who could benefit from a derma roller? Everyone could benefit from the use of a derma roller. Petunia Skin Care sent me their Derma Roller that has 540 needles that are 1.00 mm size. Have been using this derma roller for a little over a month. 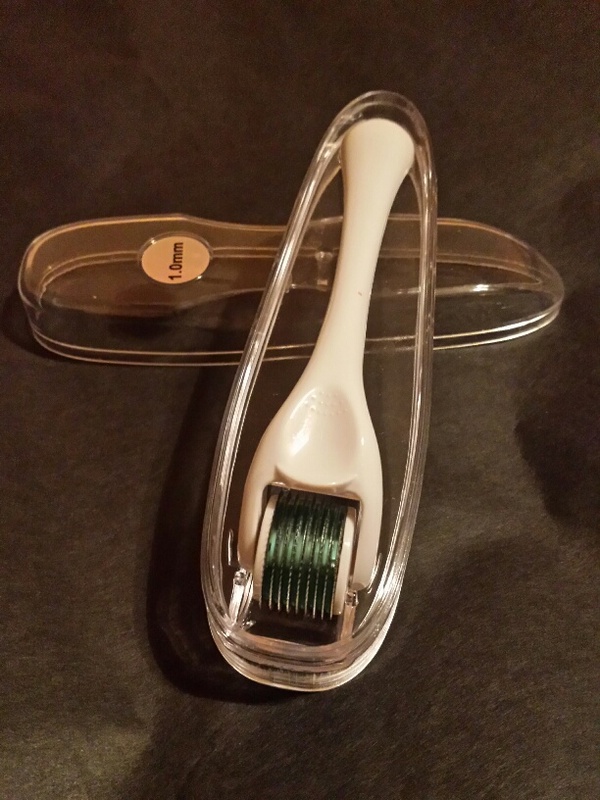 Below please see a photo that I took of my derma roller. I am new to the world of derma rollers. Let me be honest at first was a bit afraid to use it; because thought it would hurt. Yes the first time it felt slightly uncomfortable, but it was not painful. My skin needed to become adjusted to the sensation of the micro needles rolling against my it. Please see the photo below of the head of my derma roller. Using the derma roller is very easy. First your skin should be clean, and dry. Roll the derma roller 10 times per area. Roll it back and forth with steady speed & pressure. Roll your Petunia Skin Care Derma roller in four directions horizontally, vertically, & diagonally. On the package it has simple easy to follow directions. After finishing with my derma roller I clean it with spray bottle filled with water & rubbing alcohol. I use 3 parts water to 1 part rubbing alcohol. Then I return my derma roller to it’s case. After all of that I apply my serum, and allow it to dry & finish with a moisturizer. I use my derma roller 3 times a week. Saw results after the first week. Noticed a reduction in the fine lines on my forehead. Pores on my nose & the side of my nose are minimized. My skin looks plumper & vibrant. I enjoy using my derma roller. Many people of all ages, and skin types will benefit from using a derma roller. First few times you may notice some redness, but this is to be expected. Be consistent with your derma roller that way you will notice the positive results. Staff at Petunia Skincare will send you an ebook with your purchase. Petunia Skincare has great customer service, and my derma roller arrived quickly. I was sent this item for free in exchange for an honest review. These are my thoughts, and feelings. 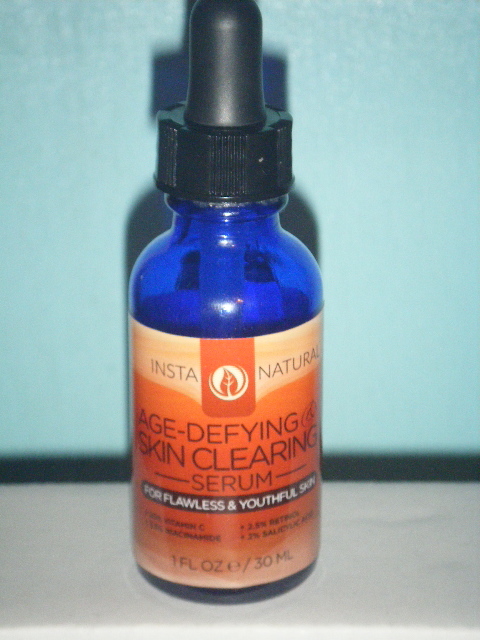 InstaNatural’s Age-Defying Skin Clearing Serum: Product Review. A new serum in my skincare routine is by InstaNatural. 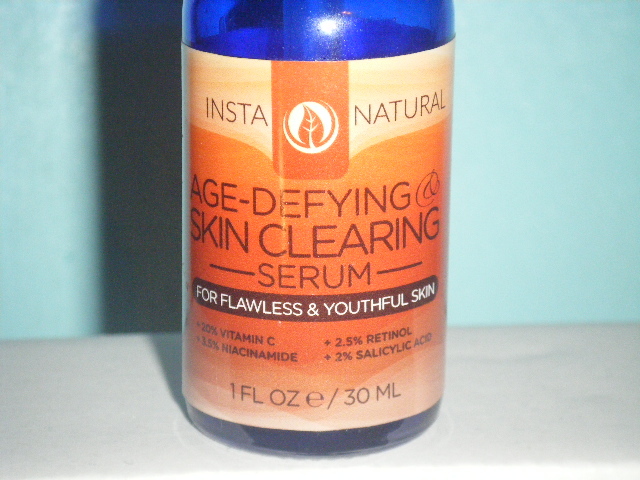 This serum is InstaNatural’s Age-Defying Skin Clearing Serum. Every person could benefit from using a serum. Yes this is called an age-defying serum, but it’s also good to have clearer, more beautiful skin. Few of the key ingredients are. Vitamin C is very important for anti aging of your skin. Retinol also helps to reverse the signs of aging. Both the vitamin c & retinol help to soften fine lines, wrinkles, sun spots & rough skin. It helps to calm skin also. Since using this serum I have had many positive results. Before starting this serum I had the remains of two pimples. After using this serum you can no longer see where those pimples were located. My skin looks perfectly clear. Feel as if my skin tone is even from my forehead down to my chin. InstaNatural’s Age-Defying Serum has a lovely orange scent. It’s not to thick nor is it to thin. Find it very easy to apply. Think the average person will need about 3 to 5 drops of the serum. The serum comes in a blue 1 FL OZ bottle. Use this serum twice a day, and apply it to clean DRY skin. Did notice a slightly tingling sensation from the serum. Felt that tingling only on my forehead, but it was not painful. Many if not most of Instanatural’s products are made in the USA. Their products are not tested on animals! This is a link to the product on amazon: http://www.amazon.com/Vitamin-Retinol-Salicylic-Hyaluronic-Niacinamide/dp/B00NY5NGPE/ref=sr_1_fkmr0_2?ie=UTF8&qid=1415202318&sr=8-2-fkmr0&keywords=age+defying+serum+instanatural it’s only 23.95$ currently. Thank you so much for reading, and stay blessed. If you have any questions please leave a comment below. 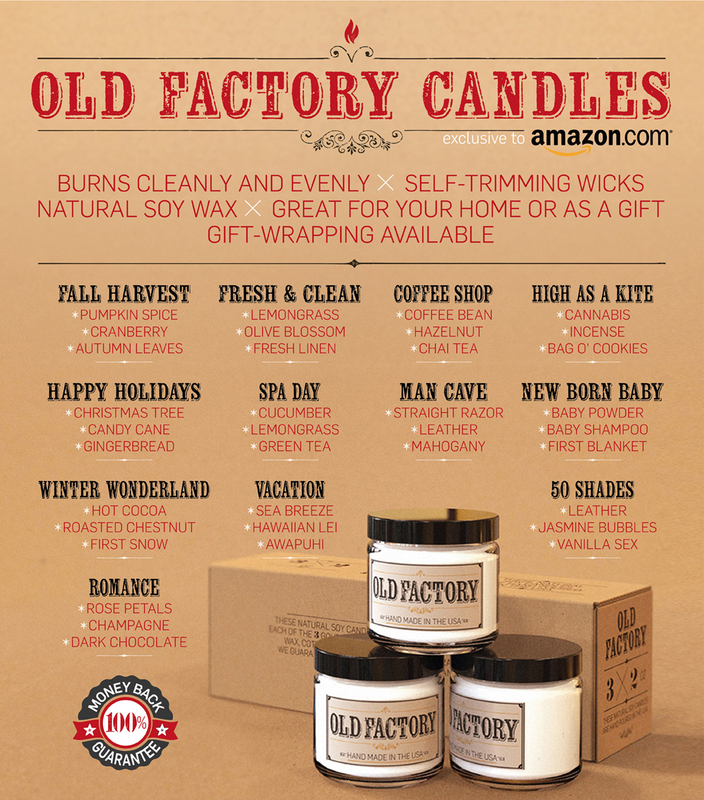 Review: Old Factory Natural Soy Candel Gift Set + a Giveaway!!! 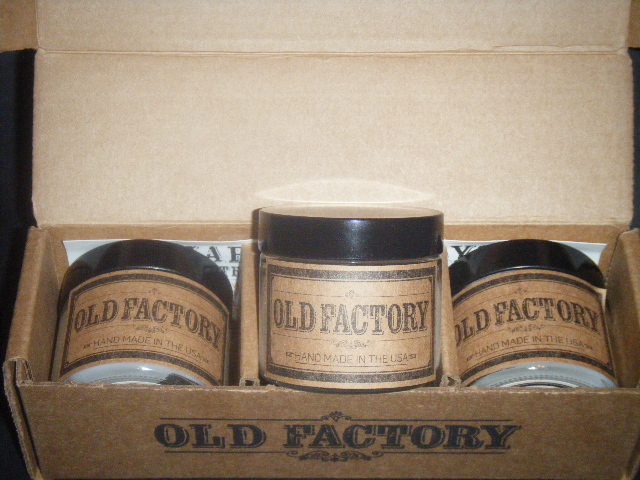 Old Factory is a new candle brand to me. 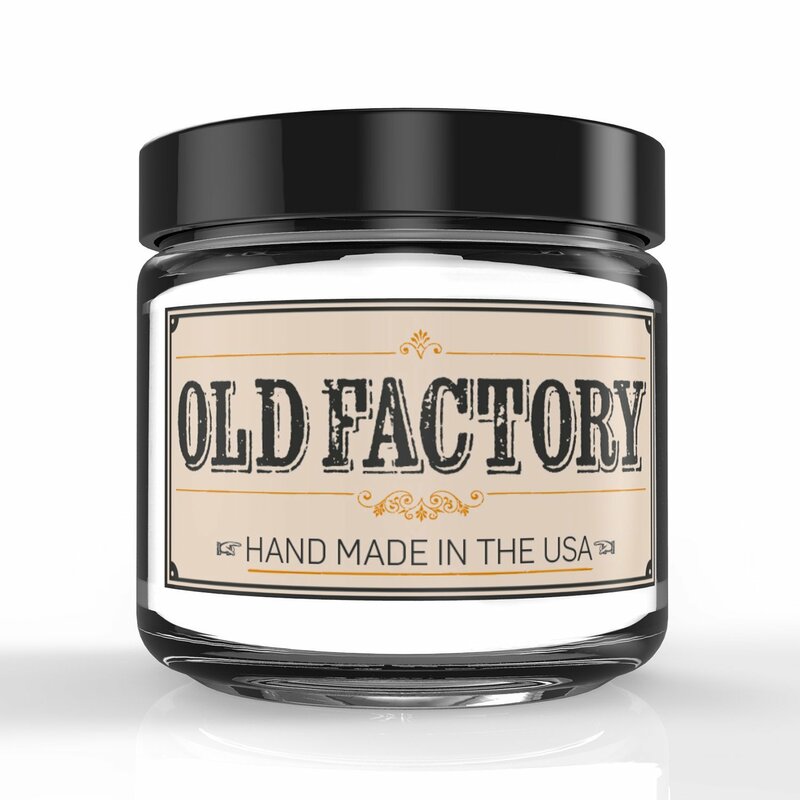 Old Factory candles are exclusively sold on Amazon. It’s important to know that these candles are natural soy candles. Love that these candles are hand poured, and made in the USA. It feels so good to buy a product that is made in the USA. While these candles are small the scent fills a room. Old factory candles will burn clean, & even for 20 hours. Have used each candle and they are true to their scent. Like that these candles are scented with pure fragrance oils. While burning these candles I get excited for the holiday season, and I am smiling from ear to ear. Choosing a fragrance theme may prove to be a difficult task. Old Factory has a theme for each collection, and the fragrances relate to that fragrance theme. Below is a list of the current fragrance themes. Yeah the all sound amazing. As I said earlier my choice was the, “Happy Holidays” collection. 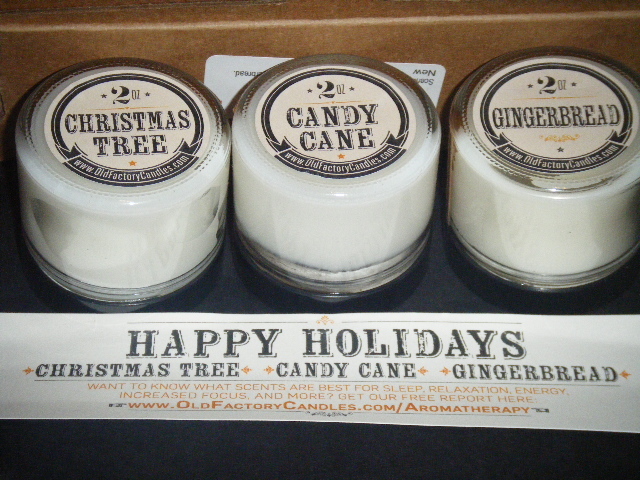 Scents such as, “Gingerbread” fill the room, and take me back to my childhood. Can almost smell the gingerbread baking in the oven. I have burned all of the scents, and all are true to their names. Just click on the above link, and you shall be on Old Factory’s Amazon sales page. There is a drop down menus that will allow you to choose your own fragrance collection. I shall have a giveaway thanks to Old Factory. First you must be a resident of the USA to win. It’s easy to enter. Simple head over to my face book page & like my facebook page. Here is the link to my facebook page https://www.facebook.com/TerryB114 easy right? Like the post about my review, and mention which fragrance collection you would like. Shall choose a winner, and you will message me your email address that I shall send to Old Factory. 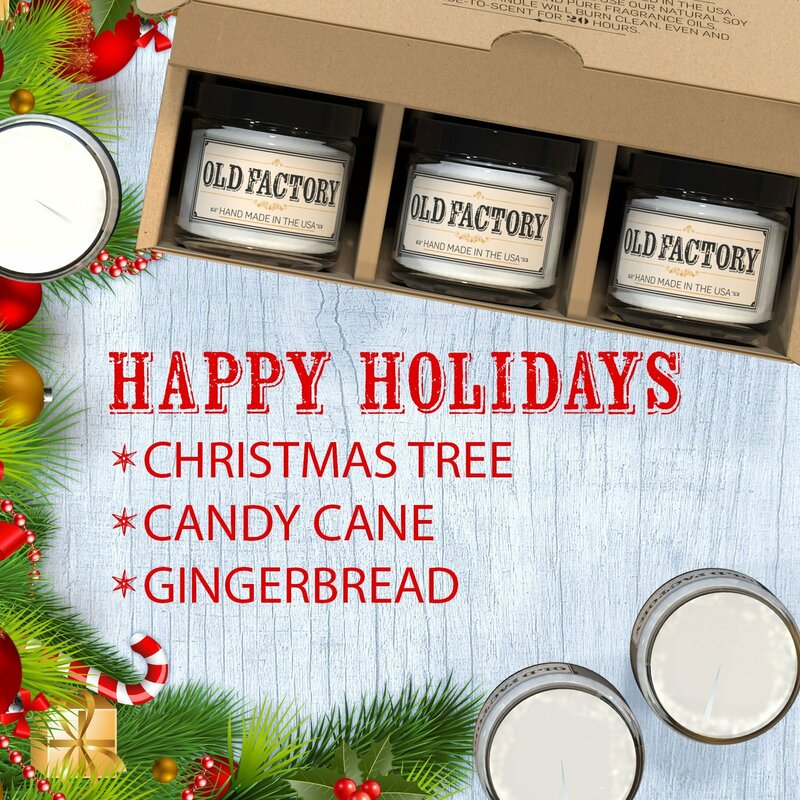 Old Factory shall send you a coupon code to get your FREE candles. Shall choose the winner on 11/7/2014. Thanks for reading my blog, and stay blessed. These candles were sent to me for free in exchange for an honest review. 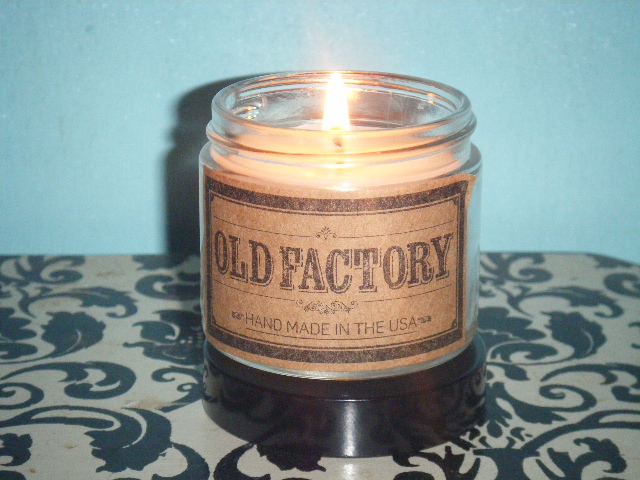 Thanks again to Old Factory for allowing me to experience their wonder Soy Candles.